“Because of the great enthusiasm in previous years, we have decided to organize a complete show weekend in Sint-Oedenrode, in which the versatility and beauty of the extraordinarily beautiful Arabian horse can be shown,” explains Annelieke Stoop the most important goal. And the organizing team reached the goal with ease! Surrounded by the Dommel river and the marsh friends of a nice atmosphere and beautiful countryside can be certain of getting their money’s worth in Sint-Oedenrode. The town has been developed into a pleasant residential area, which is close to Eindhoven. Buildings of historical interest adorn the downtown, like St. Martin Church, Henkenshage Castle or Dommelrode Castle. The peace and quiet was over when enthusiastic Arabian horse lovers came for the Arabian Horse Weekend to the Manege de Pijnhorst in Sint-Oedenrode from 20. to 21.May. And they were welcomed with the typical Southern Dutch hospitality, offered by the organizing Stoop family and their team. On Saturday morning the Arabian Horse Weekend started for the second time with the Aljassimya Farm Amateur Challenge in the main ring. The judges for this show were Mr. C. Bakker (NL), Mrs. B. Fayt (BE) and Mrs. A. Green (GB) with P. Bohmer (NL) as a probationer. Annelieke Stoop believes in Amateur shows and already organized two of them to give amateurs a chance to have a lot of fun with their own horse. It was especially nice for Annelieke to watch the Classic Pleasure Partbred class as she bred the winning horse, Kashmira Lazize, now proudly owned by S. Verlouw. Kashmira Lazize is a full sister to Annelieke’s aforementioned mare Shaemira Lazize. The show profit more from being a part of the AJF Amateur Challenge, as more people participated. 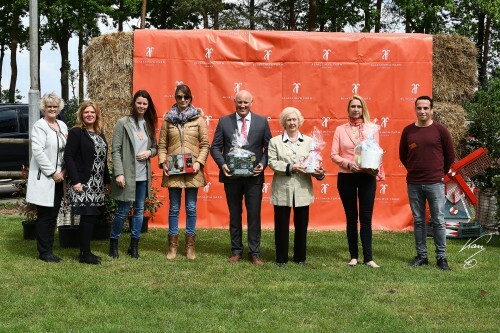 “We would therefore once more like to express a big thank you to Aljassimya Farm for giving amateurs this chance and the exceptional prices like winning the tickets and a trip to California,” says a grateful Annelieke Stoop. The Best in Show Novice was Perlina, shown by Bart Beckers, the unanimous choice of the judges. Bred by DB Arabians and owned by VDB Arabian, Belgium, Perlina is a ten years old chestnut daughter of Vivaldi Rach and out of Persenkowka by Eldon. Perlina is tracing back to the wonderful Pentoda, who has produced ten magnificent foals, all of which became either a champion themselves or the sire or dam of champions. 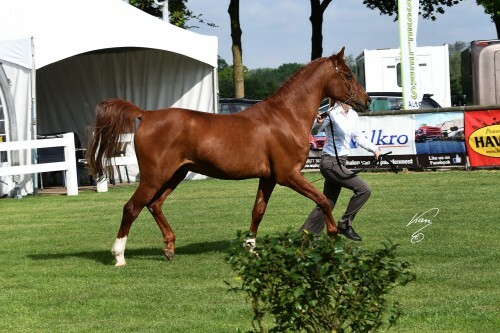 Dave de Jong achieved Best in Show Amateur with the five years old stallion LB Genesis, bred by LB Arabians and owned by Ineke van Wengerden, Netherlands. LB Genesis is a grey WH Justice son out of the Al Maraam daughter Bess-Ginger, who combined old Marbach and Spanish lines in her pedigree. 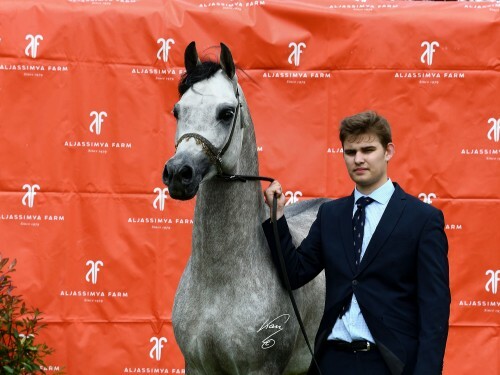 For the second time after 2016 the Best in Show Experienced went to Koen Hennekens, who was the unanimous choice of the judges, showing the grey stallion MM Esperado. The RFI Farid son MM Esperado was bred by Mario Matt Arabians and is proudly owned by Flaxman Arabians, Netherlands. MM Esperado’s dam MM Eluise is by WH Justice and out of Esfera, a full sister to first European Triple Crown Winner Essteem, by Fame VF out of Espressa. The Amateur show not only saw well-known faces. 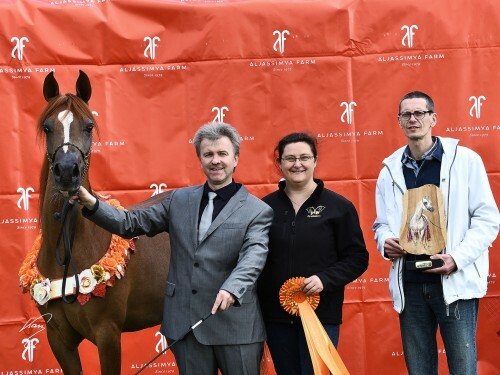 Marieke Klein Hanevald-Dirks, who is living in Sint-Oedenrode, took the opportunity to compete with her chestnut gelding Hekuras at this event. Hekuras is by Anthal out of Meddonna, bred by A.J.J. Mokveld and Marieke was proud to show her 19 years old treasure to the public, not only in the Gelding Novice class but in Train In Hand as well. A thanks goes to the generous sponsors of the Amateur Show - Aljassimya Challenge - Aljassimya Farm, Qatar.